Would you like to attract more American & Canadians to your business? Did you know that mobile apps produce 3 times more customers and return on investment than any other type of advertising? Did you know that more than 1,000,000 people search annually on iTunes and Google Play with the key words Puerto Vallarta, Banderas Bay and Nuevo Vallarta? Is your business one of the best of the bay? Well, if you have made it to this page then the answer is yes, because your business has been recommended to us as one of the local favorite businesses. Global E Apps is a digital marketing company that has been attracting Americans and Canadians for businesses for over 10 years in Puerto Vallarta. With over 10,000 hours of experience, we are sure to help your business grow and make you more money, and that is the bottom line. Mobile apps are the fastest growing advertising space available online. 70 % of your customers use a smart phone and access all of their vacation and travel info from their phone. Most travelers check the app store before they travel to find deals and the best places to eat, drink, shop and the best activities. 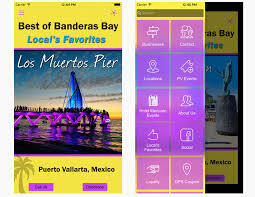 That is the attraction to the Best of Banderas Bay mobile app which is available for free on iTunes and Google Play stores. Our pricing is extremely economical because once you get a taste of the growth that your business sees from Google Play and iTunes, you will have us design your own business app as well. Summertime special: Our 1 year advertising plan is only $2500 pesos (150 USD) annually for businesses. Links to your website and all social media. 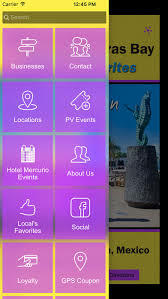 This app is getting a lot of attention and many installs and uninstalls every month because they usually download only when they are traveling to Puerto Vallarta and then uninstall once they leave. They use the app while they are here to find the activities and businesses they want to visit. Basically it is an advertising program for your business on iTunes and Googleplay with no limits and unlimited potential on the number of views that your business could receive. 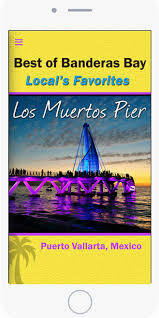 Unlike print ads, digital ads are far less expensive and can be changed instantly, the average full page print ad in Puerto Vallarta is over $10,000 pesos monthly and has a reach of only 5,000-10,000 people. That is the absolute maximum if you are lucky and hoping that your ad is seen by the visitors. This type of advertising is too expensive for the small business. Global E Apps will be advertising the app through social media (paid and free) as well on multiple sites that rank on the first page of Google for the bay area. We also will do a major email campaign to more than 10,000 emails from visitors in the area just before Christmas to capture many of the travelers for the 2018 season. Order today as the prices will go to regular pricing very soon!